Click Here To See Arrgh! #6 Hand Painted Cover Color Guide Which Comes With Art! Click Here To See Arrgh! #5 Comic Book! Check out this very nice BRONZE AGE 1975 MARVEL Cover, which was penciled by the great 1970s AMAZING SPIDER-MAN ART TEAM OF: Ross Andru pencils, and Mike Esposito inks! This Ross Andru and Mike Esposito Arrgh! #6 Cover would have been the 2nd cover for this title by the amazing team of Andru and Esposito. 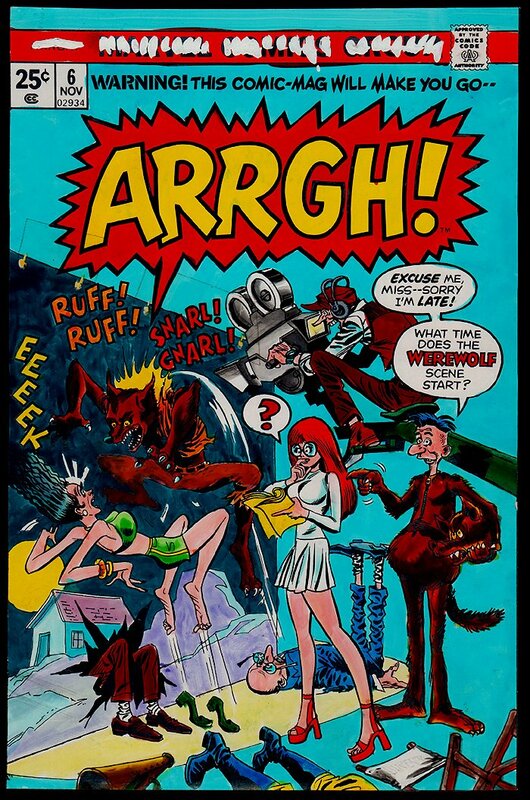 The series ended with issue #5, so that is sure to make you go Arrgh! 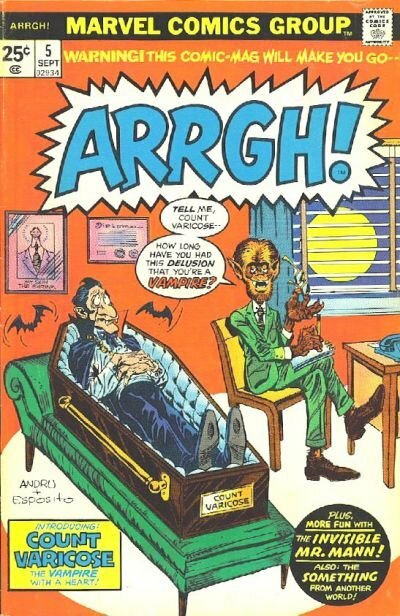 Just a funny Werewolf gag cover here, which was signed by both artists in the lower left of the image area. There is a stat with the issue number, Marvel banner, and logo affixed to the art board that seems to be the original stat. there are a few small tears (mended with tape on the back) on the right that reach the werewolf mask in guys left hand. and at the bottom that goes into the art about 2 inches, The cover comes with the original hand-painted color guide also. The art has a Marvel Comics group STAMP from 1984 on back. 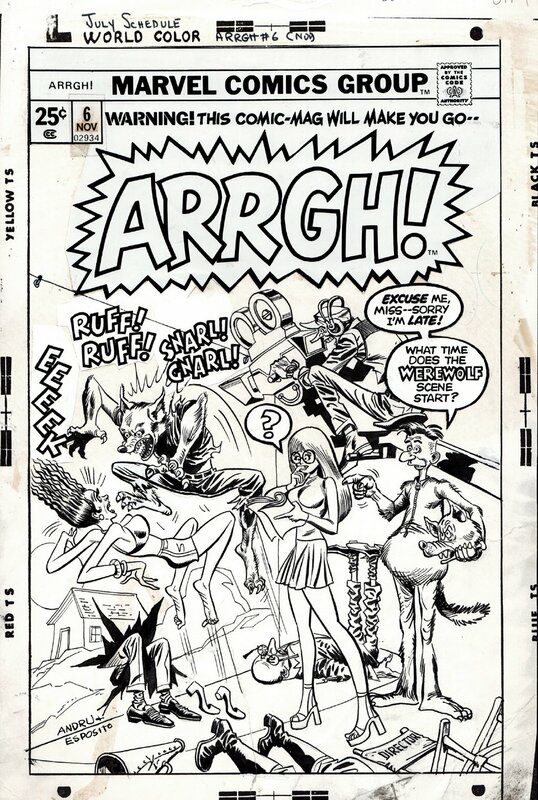 BRONZE AGE ROSS ANDRU Marvel Covers are nearly IMPOSSIBLE to find in this hobby, so don't miss out on a great opportunity here to own a Bronze Age 1975 Andru/Esposito Marvel cover at a fraction of what one of their "LATER" 1970s ASM covers would cost! ALL art on our website (including this one) are able to be purchased with VERY fair time payments, and trades are always considered towards "ANY" art on our website! Just send us an email to mikeburkey@aol.com and we can try to work something out.